Author of 28 books, Santosh Alex is a bilingual poet and widely published translator and a poetry curator. He is the founder of Rithupoetry. He is an invited poet to different poetry festivals in the country. 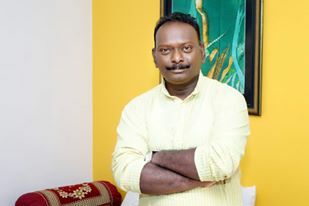 He has two poetry collection titled Dooram (2008) and Njan ninakku oru ghazal (2013) in Malayalam and one poetry collection in Hindi Panv Tale ki mitti (2013). His poems has been widely translated into Malayalam, English, Telugu,Tamil, Kannada, Konkani, Odiya, Bengali, Assamese, Nepali, Serbian, Kurdish, Turkish, Arab, Spanish and German Language. His poems have been published in International Anthologies likes Sunrise from the Blue thunder, Hudson View, Indo Australian Poetry Anthology, XXIst century Indian Poetry, Salt Boundaries and other Indian Journals viz The Enchanting Verse, Muse India , Pratilipi , Seven Sisters Post and Indian Ruminations. Dr. Santosh translates post colonial literature in English, Hindi and Malayalam, Tamil and Telugu. He has translated almost 100 writers from the country in different languages. He’s enriching Indian Literature by means of translation and creative writing for the past 24 years.